Need a sit down after Oblivion? Just Chicken offers a variety of tasty chicken meals in a modern dining facility. Just Chicken can be found just inside X Sector and can satisfy all your chicken based needs in an environment inspired by Oblivion nearby. 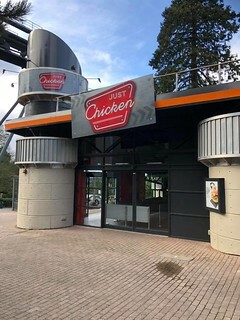 The unit became Just Chicken in 2019, previously it was known as The Fried Chicken Co. which opened in 2012 as a replacement for the the old KFC Meltdown which used to operate on the site.